The first time I heard a Mexican patient say, Me duele la paleta, the Peruvian in me was very confused. See, in Peru, a paleta is a small wooden racket, like you use for ping-pong. However, while growing up in Lima, I watched Mexican TV shows, so I was aware – and quite confident – that in Mexico, a paleta is a lollipop or popsicle. So I was at a loss when a Mexican patient used the word paleta and there was no candy in sight, just a shoulder blade that he had injured at work. It turns out that he was using one of many colloquial terms I would come to hear from patients. Such terms actually come from the names for animal body parts. Through my experience as a medical interpreter both in Arizona and California and as an instructor in New Mexico, I have learned about the demographic that we as Spanish-English medical interpreters often serve. The average Spanish-speaking patient’s educational level is at or below fourth grade, and some have lived and worked on farms. As a result, some patients borrow the animal names for body parts without being aware of the other options available to refer to parts of the human body. As medical interpreters, we need to be aware of these alternative body part names in Spanish in order to convey the correct meaning into English. If the patient says, Me duelen las tripas, we should interpret it as I have a stomachache. This is the meaning the patient is conveying – and rendering it that way will avoid confusion with the provider. Here is a list I have compiled that may be useful for interpreters who work in Spanish and English. The definitions give both the colloquial meaning as well as the strict dictionary definition. Enjoy! Bofe: Lung, specifically a cow or pig’s lung. Tosí tanto que era como golpearme el bofe. I coughed up a lung (a colloquial way in English to indicate a strong coughing spell). 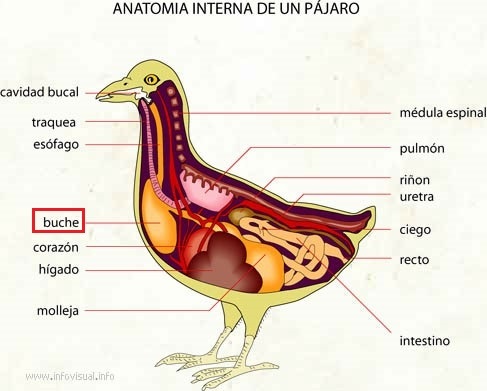 Buche: In some animals, it is the stomach, and in others, it is a membranous bag that communicates with the esophagus. Siempre anda con el buche lleno. He always has a full belly. Chamorro: In the animal world, it refers to a beef shank. Estoy parada todo el día y me duelen los chamorros. I stand all day long and my calves hurt. Cogote, pescuezo: Neck; the part of the animal that goes from the back of the neck to the trunk. He was grabbed by the neck. Cuadril: Hip or lower back. This is the bone that comes out of the last two ribs and hip of an animal. En el trabajo me agacho mucho y me duele el cuadril. I bend over a lot at work, and it hurts my lower back. Espinazo: Spine or vertebral column. Tengo una hernia en el espinazo. I have a herniated disc [in my spine]. Hocico: Mouth; the general area on the animal where the mouth and the nose are located. Me tropecé y me caí de hocico. I tripped and fell on my face. In this case, we use the word boca (mouth) in Spanish as a point of reference, just like echarse boca arriba (to lie face up) or echarse boca abajo (to lie face down). Lomo: In animals, it may refer to the entire back from the neck to the hips. Después de piscar* aguacate me duele el lomo. My back hurts after picking avocados. * People who work in the fields may use the Spanglish term piscar that comes from the English verb to pick. Paleta: Scapula, or shoulder blade. It’s the shoulder cut of beef at the butcher. Panza: Belly or abdomen. In animals that obtain energy from plants, such as cows, it is one of the four cavities of the stomach. Tuve dolor de panza y diarrea. I had a stomachache and diarrhea. Patas: All animals have patas, so it is not borrowed from any animal in particular. It should technically be translated as My hooves hurt, but a provider once joked to a friend of mine that he was a doctor, not a veterinarian, so a better rendering is My legs hurt. 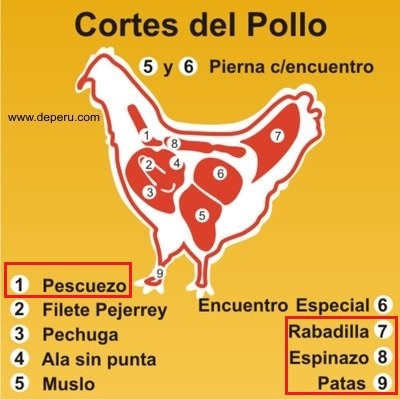 Pezuña: The fingers and nails of animals who have hooves. Me huele mal las pezuñas. Quijada: One of the two mandibles in vertebrates; jaw. Me dio un golpe aquí, en la quijada. I was hit here, in the jaw. Rabadilla: Coccyx, or tailbone, specifically on a chicken. Me caí y me golpeé la rabadilla. I fell and hit my tailbone. Tripas: Intestines; belly. This can include tripe, intestines, innards, guts, and the belly of animals. Si no como a las doce, me suenan las tripas. If I don’t eat at noon, my stomach starts growling. Trompa: Nose, specifically, a pig’s nose, but also the long, prolonged nose of other animals, such as the elephant or tapir. It can also be turned into verb forms like trompazo, which means a hard blow to the nose or face. Me cerraron la puerta en la cara y me dieron en la trompa. The door slammed in my face and hit me on the nose. The following diagrams show the specific locations of some of these terms that come from livestock. I have marked certain body parts you may hear in medical encounters. In this image, we see the pescuezo (neck), rabadilla (tailbone), espinazo (spine), and patas (legs). 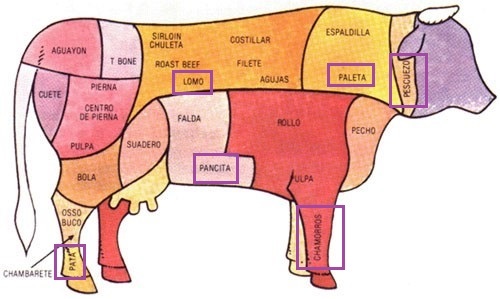 In this image, we see the pescuezo (neck), paleta (shoulder blade), chamorro (calf), panza (stomach), lomo (back), and patas (legs).